Banners have a long and colourful history, starting with religious images in churches, and pennons carried in battle. In more recent times, Trade Unions, Friendly Societies and the Labour movement commissioned thousands of banners world-wide throughout the nineteenth and twentieth centuries. And don't forget the Suffragettes whose tradition of superbly designed and made banners was followed by the Women's Liberation Movement. Peace and Community groups have continued the honourable tradition of carrying banners. Marching Colours banners follow in their footsteps. Nowadays, many banners printed on plastic, or cardboard placards	are used for one-off events - and abandoned. Banners are for rallying people, celebrating and proudly showing identity, for recruiting, demonstrating and presiding over meetings, so surely they should be permanent and well-made artefacts, satisfying signs of a group's identity. A visit to the Tolpuddle Martyrs rally, held every July in Dorset, England, demonstrates the uplifting effect of the vivid colours of trade union and labour movement massed banners. Marching Colours banners are hand-made in a traditional way, and made to last. The first banner we made, in 1982 is still going strong. Marching colours have made many very different handmade banners. Why not take a look at some in our portfolio ( click here ), or alternatively contact us by clicking here. 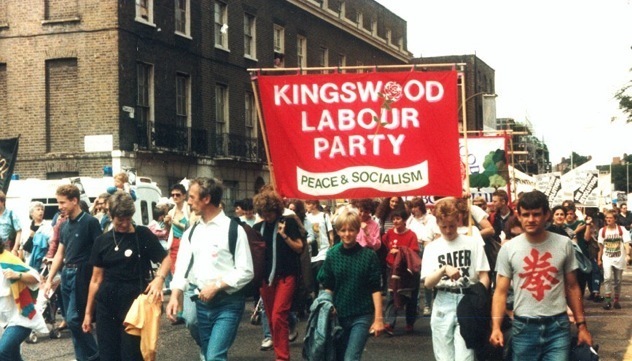 Handmade Banners are an important part of Trade Union Marches. Marching colours create the best Trade Union Banners with particular attention to detail. Handmade banners offer so much more than a convetional printed banner, Handmade banners show thought and get your trade union message accross better. Marching Colours are an ethical company who create handmade banners particularly for the Trade Union marketplace. Our banners have been seen at Trade Union marches up and down the UK. Specialist Handmade Banner Makers, Marching Colours are unique banner makers, able to create your banner design with a personal feel. Handmade banners offer so much more than printed banners. We carry out a lot of work for Trade Unions, specialising in marching banners and trade union banners.